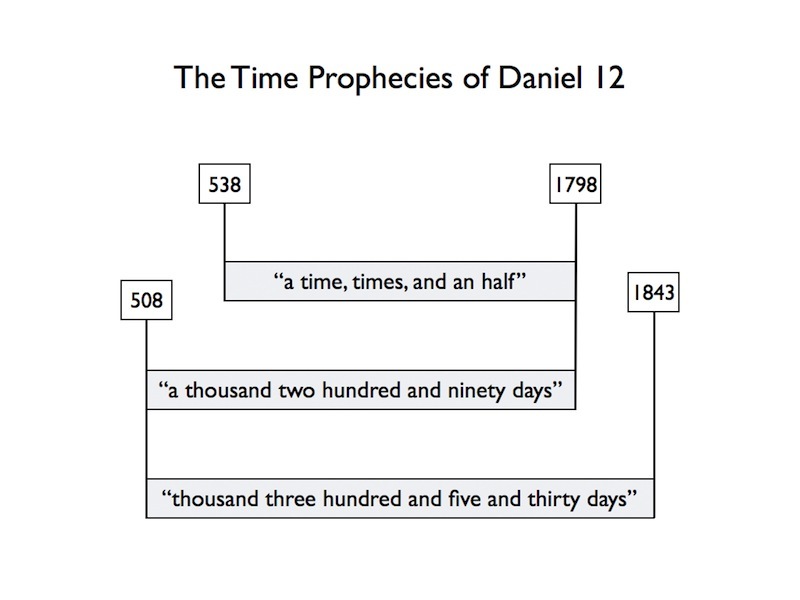 Daniel 12 contains three prophetic time periods: 3 1/2 times (or 1260 days), 1290 days, and 1335 days. In this post I will not explain the 1260 days. We will focus only on the other two time periods. Everything here is based on the premise that the 1260 days extended from AD 538 to 1798. We also assume that one prophetic day equals one literal year. To find the starting date for the 1290 days we begin with the observation that two answers are given for a single question asked in Daniel 12:6. Because both answers address the same question, both periods mentioned must have the same ending point, which the text refers to as "the end of these wonders." From that ending point it is easy to count back 1290 years. That tells us that the 1290-day prophecy began in the year 508. Now what about the 1335 days? 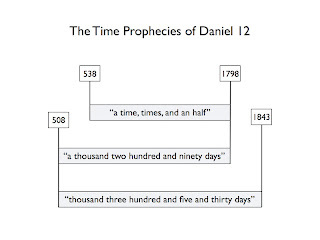 It is clear from the text that the 1290 days and the 1335 days have the same starting point. "And from the time that the daily sacrifice shall be taken away, and the abomination that maketh desolate set up, there shall be a thousand two hundred and ninety days. Blessed is he that waiteth and cometh to the thousand three hundred and five and thirty days." Daniel 12:11, 12. Notice that when the 1290 days ended, one must still "wait" until the end of the 1335. Both prophecies are dated "from the time that the daily sacrifice shall be taken away and the abomination that maketh desolate set up." So we simply add 1335 years to their common starting point, and we find that the 1335-day prophecy ends in the year 1843. At that time Daniel would stand in his lot (verse 13).